​Our Friday Night & Saturday Morning Club is for Secondary age students from Years 7 - 12. We run 2 groups (Y7-9 and Y10& ) meeting on Fridays at the St John's Warehouse in Hampton Wick and making longer trips out at weekends. ​Depth of Field and Fast Shutter sessions. It's never technically demanding but technique is important and we hardly ever work in Program or Auto mode. The main focus is on imagination and we teach students enough about Composition, F numbers and Shutter speeds to allow them to take creative control of their cameras. We have Friday night sunset trips to the iconic Albert Bridge and a walk up to Richmond Hill for one of the UK's most famous views. Our old friend Peter Macdiarmid, perhaps the UK's foremost Press photographer will talk about his life and career at the Warehouse. We'll meet at the Rec for some photographic games & finally we'll visit Brighton as we always do in the summer, ascending the British Airways i360 observation tower. Students can choose the sessions that suit them and their family - and will always find friends if they have to switch and join the older or younger group. Once again we are pleased to welcome DofE students into the older Friday Night group. By the end of this course students will be competent Dslr photographers. They will possess a variety of camera and picture taking skills that will underpin their love of photography. We teach simple Camera skills and compositional techniques and then we get out into the world with our cameras. 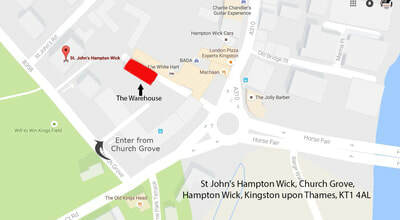 Studio sessions are based at the St John's Warehouse in Hampton Wick. This wonderful Victorian building has hosted Click for the last 6 years. With fantastic internal spaces and located close to Kingston Bridge and Bushy Park, we think it's perfect !